The annual tech mega-gathering known as CES kicks off Tuesday with a full lineup of Internet-connected gadgetry for all facets of consumer life. 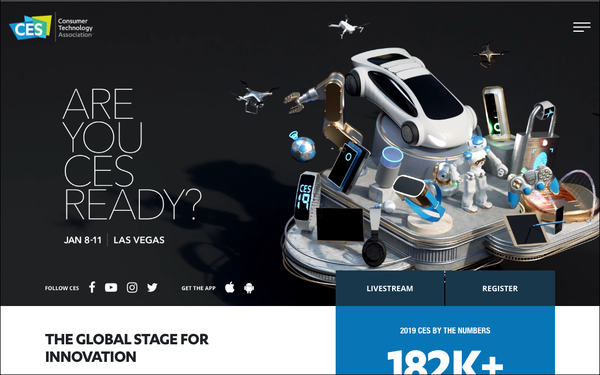 CES grows and grows, with this year’s attendance pegged at more than 182,000 people from 155 countries with nearly 5,000 exhibiting companies and sessions with many hundreds of speakers. Two days before the official opening of CES at the massive Las Vegas Convention Center and surrounding hotels, the head of research for the Consumer Technology Association (CTA), the organization that puts on CES, opens a pre-show for journalists and analysts to highlight trends and the state of the market. By time frames, 2000 was the Digital Age, 2010 was the Connected Age and 2020 will be the Data Age, said Steve Koenig, vice president of research at CTA in his opening presentation. The Internet of Things is becoming the Intelligence of Things, with the growth of embedded artificial intelligence, machine learning and digital assistants, Koenig said, noting that Amazon Alexa has nearly 60,000 skills and runs on more than 20,000 compatible devices. Other advancements are on the horizon, such as 8K TV, with the average screen size today of 48 inches growing to 50 inches in two years, with 8K TV shipments estimated at more than a million by 2021. Shipments of eyewear for augmented and virtual reality are expected to slow slightly in 2019 and then ship more than 2 million units in 2020 and closer to 3 million units by 2023, said Koenig. Many auto brands and vehicle tech suppliers will be showing their latest innovation at CES. Koenig noted that GM’s Cruise unit, Ford’s Argo AI and the Daimler/Bosch trials all are getting underway this year. He pointed out the significant investments being made in self-driving technologies. These include Ford investing $1 billion in Argo AI, Toyota putting $1 billion into Toyota Research Institute, GM’s $581 million to acquire Cruise and another $500 million investment in Lyft, Volvo’s $300 million to purchase Otto, Intel’s $15.3 billion to buy Mobileye and Hyundai’s $1.7 billion in research and development. There’s a lot of money resting on the devices being shown this week. Some are quite appropriately being introduced in Las Vegas.